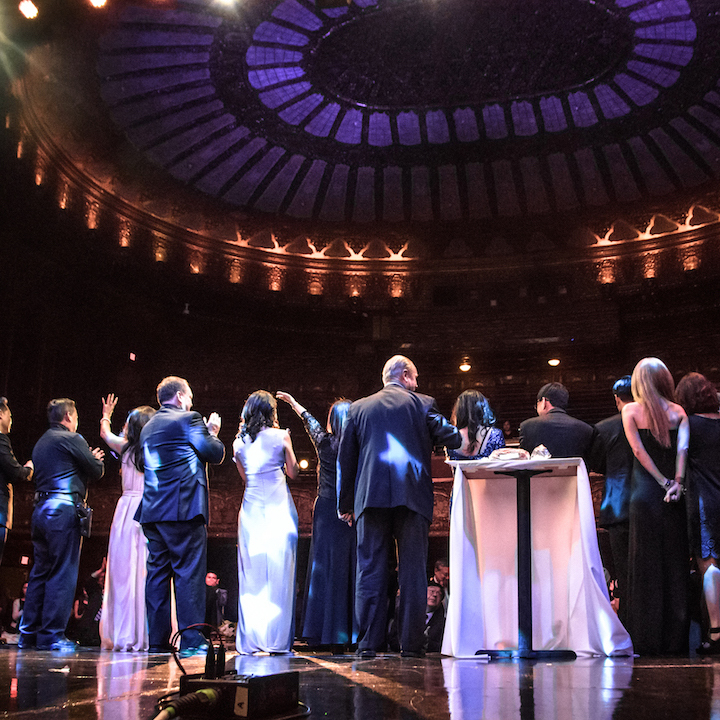 Los Angeles, CA – On Tuesday, November 15, 2016, KCCD held its 15th Anniversary Gala Dinner & Community Kick-Off of 25th Anniversary of the LA Riots Commemoration SAIGU Campaign at the historic Belasco Theater in downtown Los Angeles. With over 300 in attendance, various local, state, and national elected officials and/or their offices, along with KCCD friends, partners, board members, donor advisory board members and funders celebrated this momentous occasion. A special VIP Reception was held prior to the Gala Dinner, where attendees were able to meet and greet with notable persons, including CA State Treasurer John Chiang, Los Angeles City Councilman David Ryu, Los Angeles County Assessor Jeffrey Prang, City of Artesia Mayor Victor Manalo, City of Artesia Mayor Pro Tem Ali Sajjad Taj, City of Sierra Madre Mayor Pro Tem Rachelle Arizmendi, former City of Irvine Mayor and Dinner Co-Chair Sukhee Kang, LA Community College Board of Trustee Mike Fong and LA County Superior Court Judge Ann Park. With Richard Lui, MSNBC News Anchor and Larissa Lam, an award-winning singer, music composer, and TV/radio host as Emcees, the Gala Dinner opened with performances of Canon in D by Pachelbel and Arirang from the Open Academy Los Angeles Youth Orchestra led by Jiah Kim. Dinner Co-Chair Jihee Huh and KCCD President Hyepin Im provided welcome remarks and recognized the various elected officials, KCCD Board of Directors, Dinner Co-chairs, Dinner Committee Members, and Sponsors who made this Gala Dinner possible. “I can’t describe in words how fulfilling it was for me to work on this effort as Dinner Co-Chair. Thank you all for being a champion and for everyone here tonight supporting KCCD and the Gala. I believe in having a purpose in what we do and this event certainly serves a purpose that is critically important to all of us in this room – empowering our community.” Jihee Huh shared. Renowned saxophonist Danny Jung, provided amazing performances with renditions of My Love by Paul McCartney and Because of You by Ne-Yo. Additional performances from Tammy Chang and Sarkis Khachatryan, in which Tammy Chang sang At Last by Etta James and a special rendition of Empire State of Mind by Jay-Z feat. Alicia Keys was done by the duo. John Lim, son of Rev. Dong Sun Lim received the award on his father’s behalf and provided remarks. “Thank you so much for this tribute and to honor my great father. To me, he was an amazing, very selfless, genuine, authentic man of God. He put his life mission into serving others. Always, selflessly and endless devotion. Soon after his passing, countless people reached out to me all over the world, saying what my dad meant to them in their lives, and giving them hope and courage in their difficult times. So, I am deeply humbled and honored that he was my father, and that he will always be my father. A fireside chat was led by Richard Lui with Treasurer John Chiang, Dr. Thomas Lee, and Dr. Jannah Scott. The chat discussed key moments on what defined their leadership roles.A live auction was also held during the Gala Dinner led by Dinner Co-Chair Mark Kingston. Items that were auctioned off included a date with CA State Treasurer John Chiang which, Cancun vacation package at the Vidanta, and a 7-day retreat to the Grand Cayman Islands. Towards the end of the Gala Dinner, KCCD kicked off its SAIGU Campaign to commemorate the upcoming 25th Anniversary of the Los Angeles Riots. Los Angeles County Sheriff Jim McDonnell and Commander Blake Chow of the Los Angeles Police Department gave remarks regarding the SAIGU Campaign. In closing, one of the many events to come was the announcement to join the I AM #FACEofLA Campaign to showcase the Unity and Diversity of Los Angeles. Everyone is invited to join the campaign and submitting their photos at faceofla@kccd3300.org. More information can be found at https://www.facebook.com/iamFACEofLA/?fref=ts. The Gala Dinner concluded with an inspirational singing by all of America the Beautiful in spirit of blessing our country and our leaders! Various silent auction items were available for bidding throughout the Gala Dinner. Items included signed memorabilia from notable sports figures, such as autographed jerseys and basketballs from retired Los Angeles Lakers Kobe Bryant and signed baseball from retired Los Angeles Dodgers announcer Vin Scully. Jewelry, designer bags, and signed entertainer memorabilia were also up for bidding. We thank to Handel’s Ice Cream for the ice cream donation and Interactio for the translation service. We want to thank again our Dinner Committee, Co-Chairs, Honorees, Sponsors, Volunteers, Board, Donor Advisory Board and Friends who came to support our work and gala!